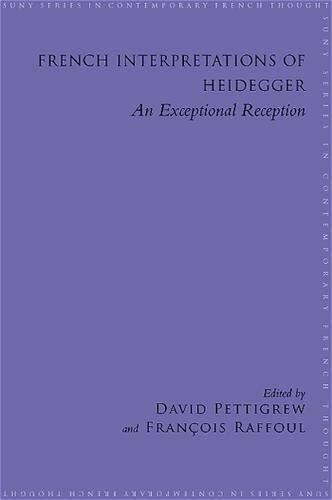 [PDF] French Interpretations of Heidegger: An Exceptional Reception (SUNY Series in Contemporary French Thought (Hardcover)) [French] | Free eBooks Download - EBOOKEE! Posted on 2018-01-25, by luongquocchinh. Description: French Interpretations of Heidegger undertakes a philosophical engagement with the work of the most significant and creative figures involved in the reception of Heidegger in France. The essays address those thinkers who have been influenced by Heidegger's thought and have interpreted it in remarkable ways, including Levinas, Beaufret, Sartre, Merleau-Ponty, Foucault, Derrida, Deleuze, Nancy, Lacoue-Labarthe, Irigaray, Zarader, Greisch, and Dastur. The volume explores the extraordinary impact that Heidegger's thought has had on contemporary French philosophy, including such movements as existentialism, deconstruction, feminist theory, post-structuralism, and hermeneutics, and illustrates its impact on the American continental scene as well. No comments for "[PDF] French Interpretations of Heidegger: An Exceptional Reception (SUNY Series in Contemporary French Thought (Hardcover)) [French]".